The 3 most common types of ear infections are otitis media, otitis externa, and otitis interna. 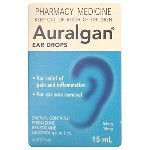 Basically these are middle, outer and inner ear infections and they cause swelling and pain that can be quite intense. If you are suffering from an ear infection and need pain relief, you will find several suitable products below for both middle ear infections (commonly associated with colds, sore throats and respiratory problems), and outer ear infections (often referred to as 'Swimmer's Ear'). Ear pain can also be caused by congestion and wax buildup, in that case use a drop that also facilitates wax removal.